Spell check feature is available in number of applications we use in Windows. But all applications do not have active spell check feature for every aspect. For example: in web browser like Internet Explorer, no spell check option while typing URL in address bar. 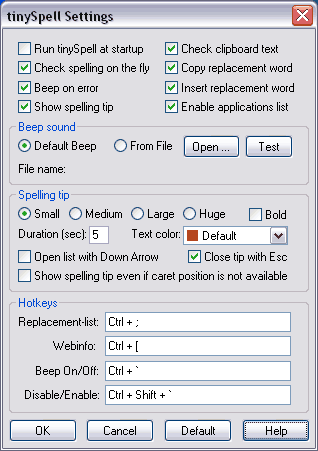 Tiny Spell is a small portable utility to get spell check feature almost anywhere in Windows. How to use Tiny Spell to check spelling? 1. Download Tiny Spell [357KB], unzip & launch application (no install). 2. TS icon will appear on the system tray, right click to change settings. 3. While typing anywhere, you will get light yellow pop-up for wrong spelling. Left click on it to get correct spelling options (as seen in screenshot below on the left). 4. Right click Tiny Spell icon on system tray and then click “Open Spelling Window”. A small window will appear at bottom right part of desktop. Type any word and click on tick button to see correct spelling options (as seen in screenshot above on the right). It has number of options that can be customized. Right click on Tiny Spell icon system tray and click on “Settings” link. You can turn ON / OFF beep sound during spell check. Change size of pop-up window for spell check. Configure shortcut keys for replacement and correction of spelling. Tiny Spell can be one must have application in your USB to perform spell check anywhere, what say? Another very good spell check program is Spell Check Anywhere (SpellCheckAnywhere.Com).